The Thompson Tide: Who Signed This??? My daughter's prized "Mikey Hat". If the signature is not legible it's because it has faded due to extreme use and abuse from an eight year old's constant use - not because the signature was scribbled. 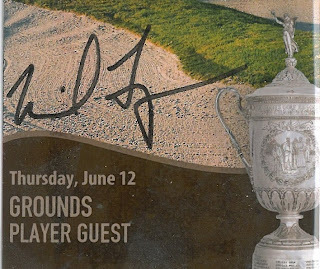 If you've ever been to a PGA tournament, you'll have seen kids and adults alike collecting golfers' signatures on a tournament flag. You can tell the people that have done it before because they keep a "cheat sheet" on the back where they write the player's name in same relative location as the front so they can tell who signed it later. That's because most of the signatures are completely illegible. 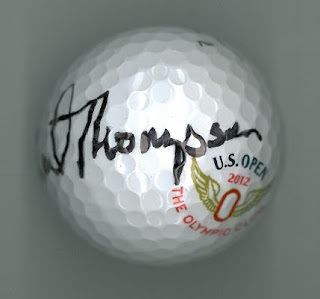 That isn't the case for Michael Thompson's signature. 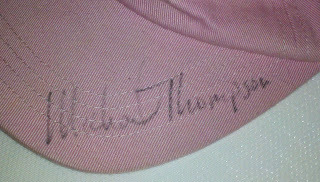 At the urging of his caddie Matt Bednarski, Michael has been working on his signature in an effort to make it legible. His goal has been to make it clear not only on paper but also on such hard to write on objects as golf balls, gloves, hats and the like. The effort has not gone without notice from family, friends, fans and now even AP golf write Doug Ferguson. I give credit to Matt. He told me to make it legible. I changed it to write every letter, to emulate Arnold Palmer. He has probably the greatest signature in history. You can't read 70 percent of the names on a flag. Every now and then you can kind of make out who they are if you know the players. Mine sticks out like a sore thumb. I've gotten more compliments on my autographs from fans, kids and parents than I ever would have imagined.